Dr. Robert Morgan (Vincent Price) is the only survivor of a devastating world-wide plague due to a mysterious immunity he acquired to the bacterium while working in Central America years ago. He is all alone now…or so it seems. As night falls, plague victims begin to leave their graves, part of a hellish undead army that”s thirsting for blood…his! Great Halloween Flick! 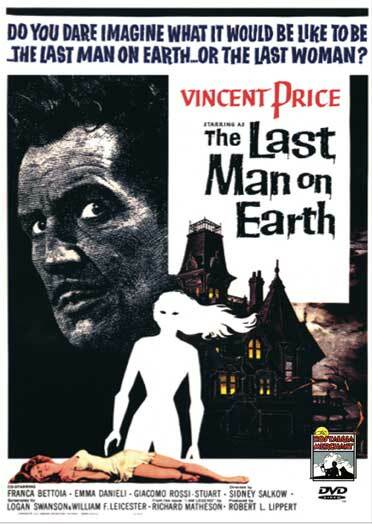 The Last Man on Earth stars Vincent Price as Robert Morgan, the last man on earth, as far as he can tell. A plague killed everyone else on the planet several years ago. He was immune to it, and can only guess why. Vampires that were formerly human attack Morgan’s home every night. 1964 – BW – 86 Minutes. Also starring Emma Danieli and Franca Bettoia.